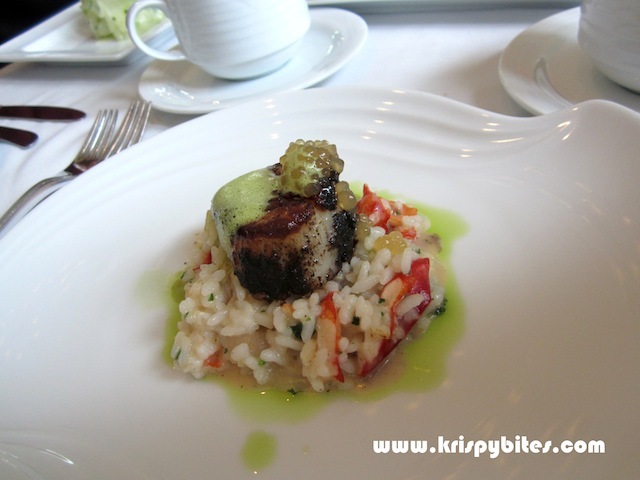 During Downtown Dining Week (March 15-24, 2013), I visited the Harvest Room in Fairmont Hotel Macdonald for a taste of their $50 executive dinner. Service was good, but not particularly impressive for a high-end hotel. The food was excellent though, and I must say this is one of the best meals I've had in Edmonton. 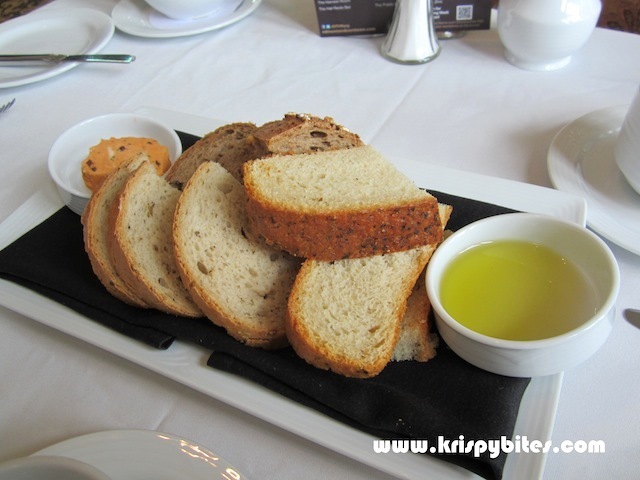 Bread (3 varieties) was served warm with olive oil and a delicious blended butter of tomatoes, black olive and herbs. 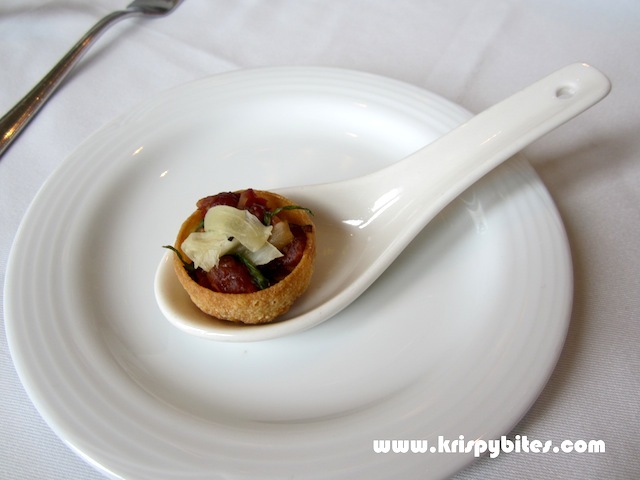 Then we each received a complimentary amuse-bouche of savoury beef tartare and refreshing pickled ginger in a crispy pastry cup. This scallop was the most tender thing ever. It was so fresh and juicy and tasty that I could eat a whole plate of them. And the charring added a very nice smoky flavour. The lobster risotto was also very good; I liked how the texture was not overly mushy and soggy. 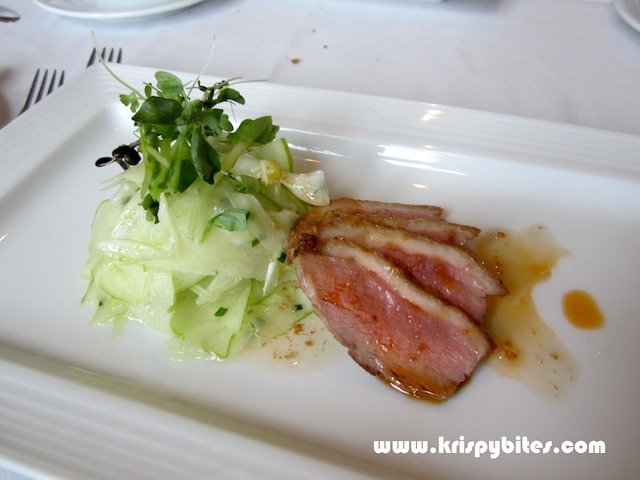 The duck breast was smoky-savoury with a slightly sweet boar bacon vinaigrette. The side of apple fennel salad was a refreshing accompaniment. 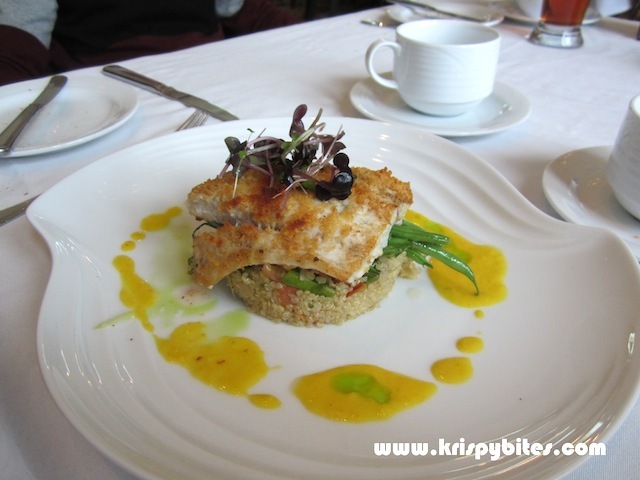 The fish went well with a tart lemon emulsion, and the bed of quinoa was a healthier and lighter alternative to rice. 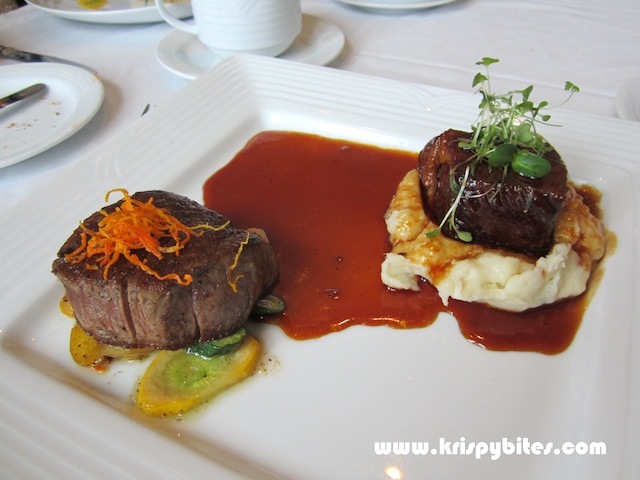 I have no complaints with the 4 oz beef tenderloin (left) as it was very tender and juicy. The braised beef short ribs (right), on the other hand, was not so great, especially after hearing the waiter's recommendation that it "just falls apart and melts in your mouth". The texture was soft, but it was a little bit chewy and most certainly did not melt in my mouth. The sauce was also a touch too salty. For me the dessert was a bit underwhelming because I'm not a fan of paté or anything with a similar texture (eg. mousse, cream). Objectively speaking though, the chocolate flavour was very delicate and not cloyingly sweet. It was actually quite nice and people who like mousses and creams would like this. I had an after-dinner caffeine treat — a creamy frothy mug of cafe caramel ($6.50). 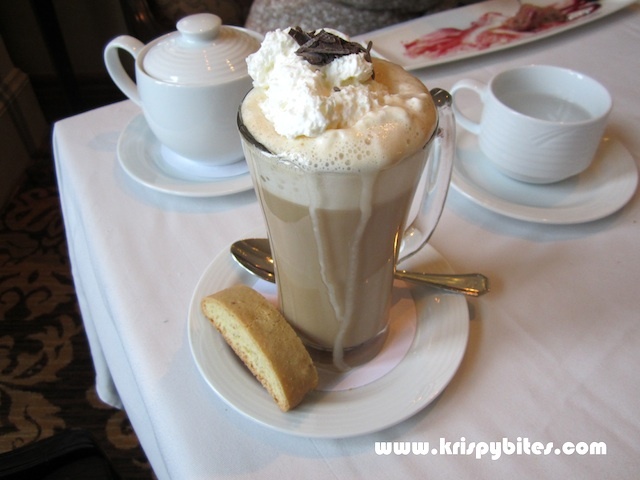 It was a combination of espresso, steamed milk, caramel and vanilla syrup topped with whipped cream and shaved chocolate. The drink was overflowing by the time it reached me. It was much tastier than I had expected with a rich and intense flavour and a perfect balance of sweetness and bitterness. The biscotti served on the side ruined it though, because it was stale and completely bland. 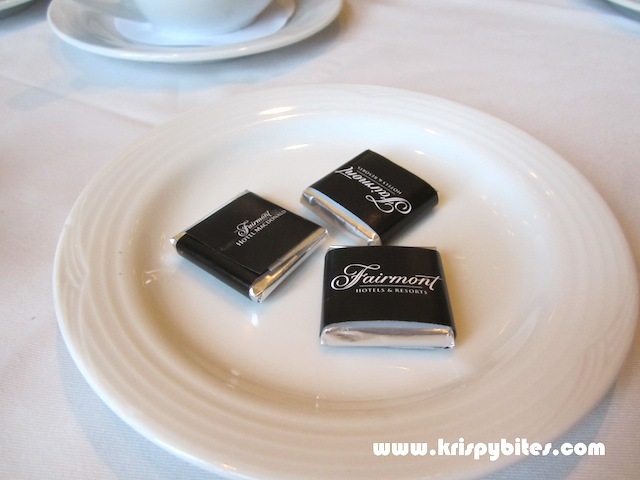 Dinner ended with the bill and chocolate squares in fancy Fairmont wrappers. Overall it was an excellent meal. 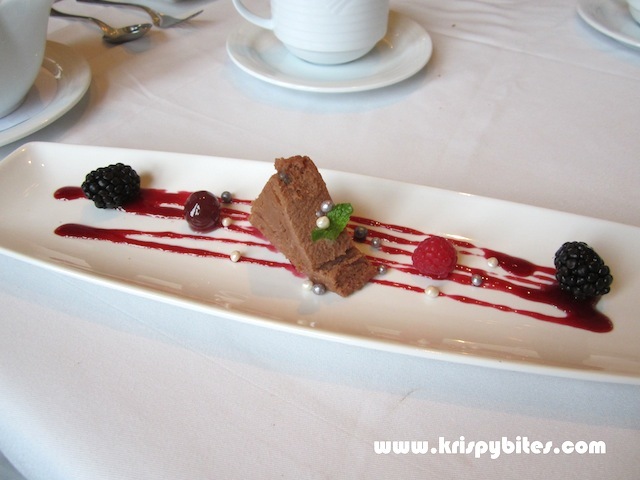 The Harvest Room is a great fine dining venue for special occasions or just a fancy dinner. I look forward to coming here again next year for Downtown Dining Week!